The Lake Apopka Marsh Flow-Way is a constructed wetland located along the northwest shore of Lake Apopka and west of the Apopka-Beauclair Canal. It began operation in November 2003 to remove phosphorus, algae and suspended material in Lake Apopka’s water. The system covers approximately 760 acres and contains four individual wetland cells, in addition to levees, canals and ditches. The marsh flow-way treats water pumped through it from Lake Apopka. Water flows west to east in the four cells and is controlled by screw gates and riser boards in the individual cells. 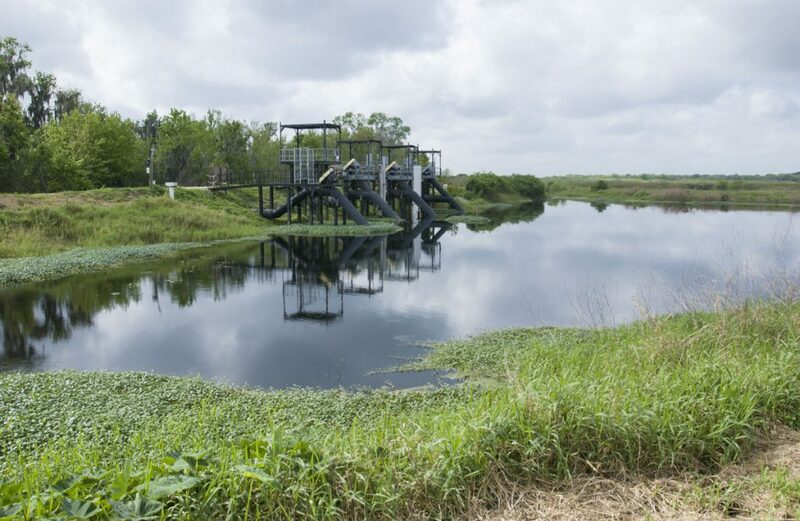 Treated water from all cells collects in a pump basin, where water is pumped into the Apopka-Beauclair Canal. Most of the cleaner, treated water returns to Lake Apopka, while the remainder flows downstream toward Lake County Water Authority’s nutrient removal facility (NuRF). Dominant vegetation communities growing in flow-way cells are shallow marsh and shrub swamp species, including species such as pickerelweed (Pontederia cordata), arrowhead (Sagittaria lancifolia), cattail (Typha sp. ), while shrub swamp includes primrose willow (Ludwigia peruviana), and some Salix spp. Open water areas are common in wetland cells. As incoming lake water passes through the marsh flow-way’s emergent vegetation, the water’s flow rate slows and suspended particles, which contain phosphorus and other nutrients, settle out of the water column. The accumulating settled organic particles, along with settled decayed wetland vegetation, form new organic material layers, which overlay native soils. Retention time of lake water within the flow-way system typically ranges between two and seven days in the individual wetland cells. Water depths in the system can vary between 30 and 45 centimeters. Like all ecologically engineered systems, the performance of the flow-way is seasonally variable. Typically, best performance is in cooler months (October through May), while performance is poor during warm months (June through September). During the long-term, system performance has been similar to initial predictions. Through September 2016, the system removed about 29 metric tons of total phosphorus from Lake Apopka water, or a yearly total phosphorus removal rate of 2.6 metric tons and a percent mass removal efficiency of 27 percent. The pattern of total phosphorus rate was similar. The system removed substantial amounts of total suspended solids (4,200 metric tons per year; 84 percent efficiency) from incoming Lake Apopka water. During the initial years, phosphorus and suspended solids removal rate increased due primarily to increased amounts of inflowing Lake Apopka water. After 2008, removal rates decreased due to the combined effects of concentration decreases in Lake Apopka, and decreased amounts of inflowing lake water. In addition, during 2009, the St. Johns River Water Management District undertook maintenance on two of the wetland cells and these cells did not treat lake water during this period.